Let us make an effort to get to know more about the two. This acts as a buffer for the pH level of your water. It helps in such a way that it will keep the water steady so that the pH level of water will not drastically change. It will help if you can have some products handy that will maintain the pool’s pH remain balanced. It has been discussed earlier than normal pH levels are between 7.4 – 7.6. There are a lot of factors that will make the pH levels of your pool change tremendously. For example, if rainwater falls on your pool, you can expect that the pH levels will show some slight changes. If in case you do not understand the numbers that are shown, if the pH level is low, it means that the water that you have in your pool is acidic. If the pH level is higher than the prescribed numbers, then the pool water is essential. To give you a basic idea why pH is important, the water that we use on our bodies are usually neutral. If they are not, they will burn when you place them on your skin. If the pH level is too high, it will dry out our skin entirely. 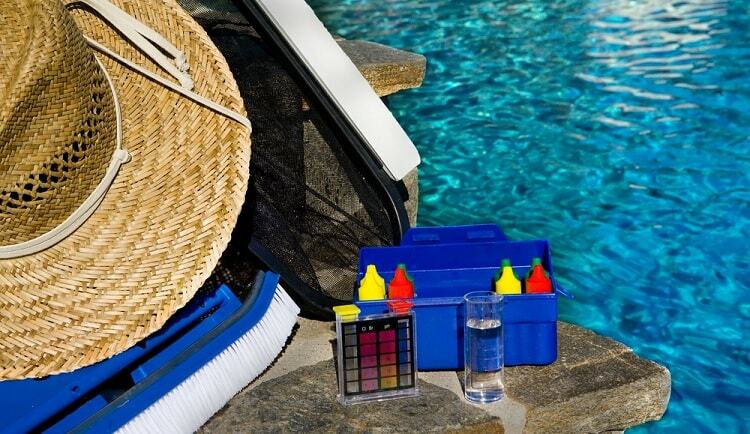 It is best that you will keep some products handy to maintain the pH level of your pool. The water stuck in the pool needs calcium. Without calcium, water will start its destruction of the pool area. There is an item that you need to place just enough calcium in your pool water. Based on the things mentioned above, you already have an idea about the items you need to maintain your pool. If your pool is new, you may not know how to keep the pH balance levels yet, and it might fluctuate depending on the weather, climate and the things that might fall into your pool. You can use home test kits to check your water’s pH level. PH Increaser – This will increase your pool’s pH level when the pH level is low. PH Reducer – This can decrease pool’s pH and alkalinity level. Alkalinity Increaser – This can increase pool’s pH level. In the beginning, you will find it tricky to use these chemicals, but as you continue trying to tune your pool’s pH levels fine; you will begin to understand how much you can use to improve your pool’s pH levels. One of the most important reasons why you should keep your pool water balanced is because it can make cleaning your pool more efficient. Now that you already know how to keep your pool water level balanced, you need to know how to sanitize your pool properly. The most common chemical that people use to clean their pools is chlorine, but there are still others that you can use to keep your pool clean. Chlorine is used basically because it is an active bacteria and algae killer. It also does not cost a lot of money which is probably the reason why most resorts use this. Chlorine now comes in different forms so you can easily place it in your pool water. Chlorine Tablets – This is the most traditional form available because you can quickly place them on the chlorinator of your pool. Salt Chlorine Generator – If you want to use table salt to clean your pool by turning it into chlorine, this can be highly useful too. Powdered Chlorine – This is usually scattered in different parts of the pool depending on the instructions. One Tip to Remember: When purchasing chlorine, look for chlorine that has an active ingredient of either Dichloride or Trichloro. This will let you know that the chlorine you are going to use has already been stabilized. You may be wondering why you need to be stabilized chlorine. The sun’s rays can eat up the chlorine, but in stabilized form, it will be slower. Some pool addicts may be familiar with Bromine because of this more commonly used in hot tubs and even indoor pools. This is preferred by some people because it does not have any odor. This is not recommended for outdoor pools because sunlight can eat it up quickly. At the same time, it may not protect outdoor pools from a certain type of algae. This can make outdoor pools get dirtier in a fast manner. If you are planning to put some crystals in your pool, make sure to add about 0.5 ppm. You need to have a mineral system to place this, and they can effectively sanitize the water. It may take longer than chlorine to sanitize the pool water, though. You can use this only if you do not want to use full chlorine on your pool. If you want to use something other than chlorine, then this may be the best alternative to using. This is effective in sanitizing the pool some people have said that it may even be more efficient because of its ability to make the pool water feel smoother. Remember that this type of chemical can be purchased in liquid form and they may also be more expensive than chlorine so be prepared to spend more if you would decide to use this. If you are not familiar with the term, this is a process that you do wherein you are going to add a lot of chlorine to your pool. You need to add a lot of chlorine to reach break point oxidation. You may need to do this once a week to maintain your pool’s sanitation. FC (Free Chlorine) – This is the type of chlorine available to kill. CC (Combined Chlorine) – This is the kind of chlorine that has already gotten rid of the algae and grime found in the pool water. Even if you would see and check out some products that are meant to be used for pool shock and breakpoint oxidation, these items contain chlorine that has not been stabilized. This means that when they become exposed to the rays of the sun, the sun will eat them all up. To make this useful, it is best that you will do this at night. You also need to leave your pool running until the morning light starts to appear. Even if you use the basic items that can keep your pool clean and will maintain your pool’s pH levels, here are other products that you have to be familiar with so that you can also use them whenever you need to. From the name itself, you can already guess that this can prevent algae from causing chaos in your pool. There are a lot of items that you can use, and there are so many products to choose from, but chlorine is still the best algae killer. If you do not have chlorine on hand, having an algaecide will at least keep the algae from spreading before you can use chlorine to kill the algae effectively. A lot of the chlorine products that you will see are stabilized, but if in case you need to use chlorine that is not stabilized yet, you can add the water stabilizer also known as the cyanuric acid to your pool. This will decrease the rate that the chlorine will be eaten up by the sun’s rays. Do you know what causes the water to become cloudy? It is the different small particles that you can use to make your water cloudy. When the small particles all become big particles, you can quickly remove them from your water. There may be instances when some metals will find their way into your pool. A lot of times, it is copper and iron that you may find in your pool because of rusty metal pieces from other items that came in contact with your pool water. The use of the metal remover will make the metals evident, and the pool’s filter will remove them from your pool. You have learned by reading the information above that you need water balance and sanitation to make your pool’s chemistry perfect. You need to maintain the pool’s pH level from 7.4 – 7.6. Chlorine may still be the best item that you can use to sanitize your water, but there are also other chemicals that you can use as alternatives. As long as you would practice proper pool sanitation and if you can filter your pool actually, you can keep your pool clean and healthy efficiently.